When word broke last week that the San Francisco 49ers had agreed to trade backup quarterback Alex Smith to the Kansas City Chiefs, the NFL community was abuzz with gossipy cynicism. Not only was Smith the latest and most significant domino to fall in a decidedly unsexy quarterback market, but the price he commanded from the Chiefs — the second pick in the second round of April's NFL draft, and a conditional 2014 pick that reportedly could be as high as another second-rounder — blew the minds of many coaches and executives around the league. "I'd say it was somewhere between steep and outright theft," one AFC general manager said in response to the trade, echoing the sentiments of many of his peers. "I would have had a hard time giving up two 2s. He was a free agent last year, and it's not like people were pounding down his door to sign him." Yet there's a very viable reason that Smith is a much hotter commodity in 2013 than he was a year ago: This is a far chillier March for NFL teams in search of starting quarterbacks. With an underwhelming free-agent class (one further depleted by the Philadelphia Eagles' decision to stick with incumbent Michael Vick), a handful of tenuous options via trade and a much-maligned class of draft-eligible passers, the six remaining franchises who are in major need of an upgrade at the sport's pivotal position are desperately seeking solutions. This wasn't such an issue in 2012, when a highly regarded class of incoming rookies — including the eventual top two overall picks, Andrew Luck and Robert Griffin III — provided a clear path to salvation. The Washington Redskins sent three first-round picks and a second-round selection to the St. Louis Rams last March to move up four spots in the draft with RG3 as their target. Griffin's offensive rookie of the year performance, along with similarly brilliant debut seasons by Luck (Indianapolis Colts) and Russell Wilson (Seattle Seahawks), justified the exorbitant price. That the Chiefs, who hold the No. 1 overall pick in this year's draft, opted instead to shell out a pair of selections for Smith should tell you all you need to know about the perceived weakness of this year's rookie quarterback crop. Just as fictional pilot Steve McCroskey famously picked the wrong week to quit sniffing glue, it looks as though the Jacksonville Jaguars, Oakland Raiders, Cleveland Browns, Arizona Cardinals, Buffalo Bills and New York Jets picked the wrong year to start shopping for QBs. Two years ago, the Jags took Blaine Gabbert with the 10th overall pick, and he became the team's starting quarterback early in his rookie season. Since then, every major decision-maker in the building has been replaced with a trio of newcomers: owner Shad Khan, general manager Dave Caldwell and coach Gus Bradley. And when Caldwell and Bradley do their due diligence on Gabbert, they may not like what they hear. 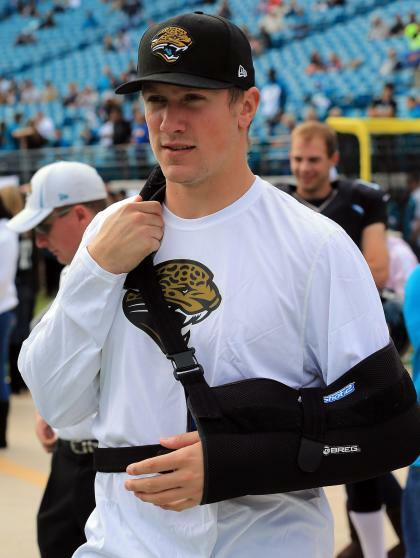 First of all, at the Jags' facility, the 23-year-old is known as Blame Gabbert. "Nothing's ever his fault," said one former Jags assistant. There are internal knocks on Gabbert's intangibles (leadership, attitude, accountability) and, though his pocket presence improved last season, there were still concerns that he gets "scared" under pressure. He also has issues with accuracy (58.3 completion percentage in 2012). With all of that said, the Jags haven't completely given up on their investment. There's a scenario in which Gabbert goes into training camp as the team's presumed starter, though it's likely the team will bring in at least one young passer. The Jaguars are also open to acquiring a veteran, though it would have to be someone they like more than incumbent backup Chad Henne, who played reasonably well after Gabbert went down with a season-ending injury to his throwing arm in November. "Don't be surprised at anything we may or may not do," one high-ranking Jags source says. "There are no options off the table." Well, there's one option that's off the table and has been swept into the dustbin and deposited into the compost pile: signing Tim Tebow. If the Jags tried to trade for a passer such as the Seahawks' Matt Flynn, the New England Patriots' Ryan Mallett or the Eagles' Nick Foles, that would be somewhat surprising. So would acquiring a potential castoff like deposed Chiefs starter Matt Cassel or Bills incumbent Ryan Fitzpatrick, who is on shaky ground in Buffalo. Signing a free agent such as Matt Moore, Drew Stanton, Jason Campbell or Chase Daniel might be a bit more plausible. If the Jags become locked in on any of the incoming quarterbacks, I believe they won't hesitate to use the No. 2 overall pick on an heir to Gabbert. I also think it's possible, though not likely, they'd do that and keep Gabbert as their current starter, in the hope of creating a situation similar to last decade's Drew Brees/Philip Rivers logjam in San Diego. Suffice it to say that not many people in the building believe that will happen. Carson Palmer, according to a well-placed team source and published reports, will be asked to restructure his contract — which, in this case, is code for take a pay cut. Due to make $13 million in 2013, with a reported salary-cap figure of $15.3 million, Palmer could give Oakland some much-needed cap relief while preserving his best chance to remain an NFL starter at 33, as he probably wouldn't generate a ton of interest on the open market. That said, the Raiders hope Palmer — who took a break two seasons ago before coming to Oakland in an oft-maligned deal shortly before the October 2011 trading deadline — doesn't call their bluff and call it a career. Though Raiders coach Dennis Allen and newly hired offensive coordinator Greg Olson have said there will be "competition" between Palmer and backup Terrelle Pryor, the realistic expectation is that Palmer will retain his hold on the job. Then again, owner Mark Davis is clearly dissatisfied, as the continued pursuit of former Packers and Seahawks coach (confirmed by a league source to Y! Sports) Mike Holmgren for a possible front-office job suggests. Davis, the team source says, is the impetus behind the push to evaluate Pryor, a mobile and athletic ex-Ohio State star who his late father, Al Davis, selected in the third round of the 2011 supplemental draft. A recent report by ESPN's Chris Mortensen suggests that the Raiders might target Geno Smith, the fastest quarterback at the recently concluded NFL scouting combine, with the third overall pick and team him with Pryor, essentially stacking their depth chart with players who could run a read-option-style attack. In that scenario, a player like former Tampa Bay Buccaneers backup Josh Johnson could also be signed, allowing the Raiders to practice that style of offense exclusively. However, given the Raiders' preponderance of other needs and dearth of draft picks (they have no second- or fifth-round selections this year), that's not a likely scenario. The smart money is on Palmer restructuring and remaining as the starter, with a close eye on Pryor's preseason performances as a compass for future moves. 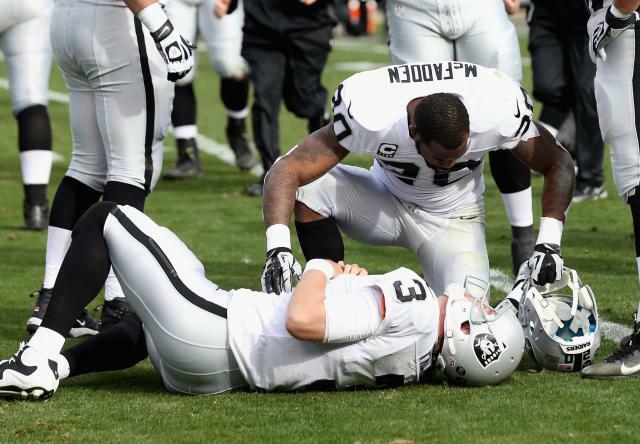 And if he faceplants, well, there's always JaMarcus Russell. Kidding, Raider Nation! Kidding! Like the Jags, the Browns have a completely new regime in place: owner Jimmy Haslam, CEO Joe Banner, general manager Mike Lombardi and rookie coach Rob Chudzinski. And while Haslam and Banner might have come in hell-bent on a splashy overhaul at the quarterback position, Chudzinski and his offensive coordinator, former San Diego Chargers coach Norv Turner, appear focused on developing current starter Brandon Weeden. Though Weeden had a choppy 2012 season — running back Trent Richardson recently told NFL Network's Steve Wyche that his fellow rookie struggled reading defenses — he has a strong arm and could thrive in Turner's offense. Just as Turner, while the 49ers' offensive coordinator, once helped Alex Smith improve greatly after a rough rookie season, Weeden could be his next reclamation project. The former Oklahoma State star is all for it. Weeden says he is "pumped" about working with the veteran quarterback guru, while his backup, former Cleveland starter Colt McCoy, is similarly enthusiastic, calling his current situation a "new lease on life." Banner has said selecting a quarterback with the sixth overall pick "is not the focus of our thinking," but that could certainly change if the team believes that one of the incoming rookies is a franchise-caliber quarterback. The Browns don't have a second-round selection, having used it on wide receiver Josh Gordon in last year's supplemental draft, but could theoretically trade up to draft a young passer to push Weeden. As far as veterans go, if the Chargers part ways with backup Charlie Whitehurst, Turner might lobby to acquire him as the second or third man on the depth chart. It's unlikely the Browns would try to trade for Whitehurst, who is under contract for 2013. No team, arguably, is more desperate for a quarterback upgrade than the Cardinals, who have been mired in a quagmire at the position since Kurt Warner retired following the 2009 season. 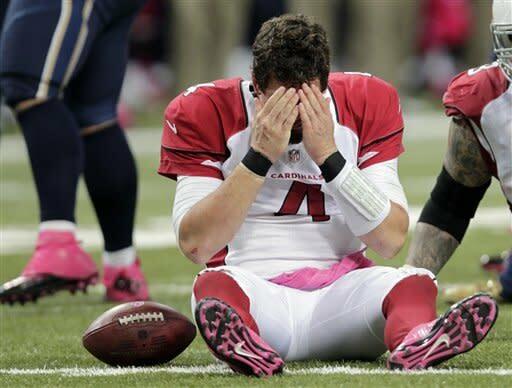 Since then, Arizona fans have been treated to a trail of tears under center, featuring Matt Leinart, Derek Anderson (it's not funny), Max Hall, John Skelton, Kevin Kolb, Ryan Lindley and Brian Hoyer. Those three miserable years cost general manager Rod Graves and coach Ken Whisenhunt their jobs, with Steve Keim and Bruce Arians, respectively, taking over as their replacements. And Keim and Arians need to find a competent quarterback to have a prayer of competing in a suddenly robust division that features the defending NFC champion 49ers, the ultra-strong Seahawks and a St. Louis Rams team that made a huge jump in coach Jeff Fisher's first year. Suffice it to say that the current trio of Kolb, Skelton and Lindley won't come close to cutting it. And I have to believe that the new regime is thinking big, on many levels. Arians, who had a long, productive relationship with Ben Roethlisberger during his stint as the Pittsburgh Steelers offensive coordinator and tutored Luck in Indy last season, loves large, sturdy, strong-armed quarterbacks. Newly hired GM Keim, who was a Cardinals scout back in 2004, wrote a glowing report about Roethlisberger when the future first-round pick was coming out of Miami (Ohio). Chances are, the next Roethlisberger's not walking through that door. But I do believe he's the prototype for Arians, and that will carry a lot of weight over the next two months. So who, in the tradition of Johnny Bravo, might fit the suit? 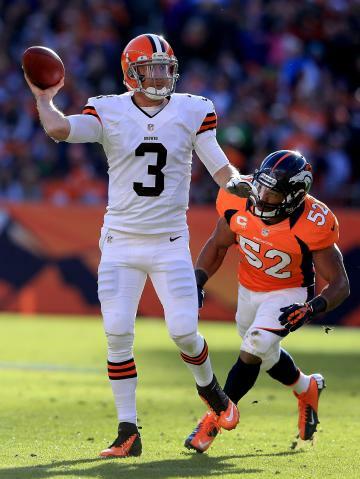 Glennon, a 6-foot-7, 225-pounder, is charitably compared to the Baltimore Ravens' Joe Flacco, though he performed inconsistently in college and his toughness has been questioned. One general manager said Glennon has some "similarities" to Texans quarterback Matt Schaub. If the Cardinals decide that Glennon is their guy, they'd likely take him with the seventh overall selection. And though Barkley is shorter than the typical Arians quarterback, and his arm strength isn't phenomenal, he's another legitimate possibility at that draft spot. Geno Smith, conversely, is not someone Arizona would likely consider. Should the Cardinals elect to wait until the second round or later, there are some less polished options. Manuel (6-5, 237 pounds) is somewhat raw but has a great deal of upside, and the strong-armed ex-Florida State passer will almost certainly be available when the Cards are on the clock with the sixth pick in the second round. Then there's another Miami (Ohio) quarterback, Zac Dysert (6-3, 231), who will likely last into the middle rounds. Tennessee's Tyler Bray (6-6, 232 pounds) is another big-armed passer, though scouts have concerns about his maturity and temperament. The Cardinals are also evaluating various trade options. Foles, a third-round pick of the Eagles last year who played reasonably well in starting the final six games, is a possibility; one AFC personnel executive referred to the strong-armed, slow-footed Foles, who played collegiately at Arizona, as a "poor man's Roethlisberger, without the foot speed." Another option could be Ryan Mallett, Tom Brady's backup in New England, who has received rave reviews internally since slipping to the third round of the 2011 draft. Because the Pats would want a return on their investment, it would probably take at least Arizona's second-round pick (38th overall) to land Mallett. Drew Stanton, who Arians coached in Indianapolis last season, is an obvious free-agent option, though it's hard to imagine the Cardinals trotting him out as their 2013 starter. As unappetizing as this may sound to Cards fans, it is possible that Kolb could open next season under center, especially if the Cardinals draft a quarterback they consider a project in the later rounds. Right now, Keim, Arians and other Arizona personnel executives are feverishly evaluating their draft and trade options before deciding how to manage Kolb's contract situation. Due a $2 million roster bonus on March 17 — and a $9 million base salary in 2013 — Kolb would likely be asked to restructure his deal (and take less money) if the Cardinals decide they want him to stay. Given an apparent lack of other options, Kolb's most prudent course of action could be to take the pay cut and try to beat out the young quarterback (or quarterbacks) brought in to replace him. Given that Kolb played well in the first month of the 2012 season before suffering a serious rib injury, this isn't necessarily a terrible scenario for the franchise. The fact that Arizona has already paid him $20 million over the first two years of his deal — and that Kolb would cost $6 million against the cap for 2013 if traded or released — creates more inertia toward trying to retain him. To summarize: Cardinals fans are really hoping that Keim and Arians get fired up about Glennon, Barkley or one of the other aforementioned young quarterbacks in the coming weeks. There's a growing sense in NFL circles that new coach Doug Marrone will target Nassib, who starred for him at Syracuse the previous three seasons, with the ninth pick of the second round (41st overall). "If I'm a team that needs a quarterback and wants the Syracuse kid," one AFC front-office executive said, "I know I've gotta get ahead of Buffalo in the second round." It's possible that Nassib, who is lauded by scouts for his accuracy, quick release and leadership skills, could be off the board before then. Currently, it's hard to conceive of the Bills taking him in the first round, but if Nassib starts shooting up draft boards, don't rule it out. In theory, the Bills could continue to go with Ryan Fitzpatrick while grooming a young replacement, but they'd likely listen to trade offers for the veteran, who if nothing else would be a high-end backup for most teams. Due a $3 million roster bonus on March 13, Fitzpatrick might be asked to restructure his contract (he's due a $4.45 million salary in 2013 and would likely be asked to take less) or could be released outright. Former Seahawks and Vikings starter Tarvaris Jackson is also on the roster and would provide insurance as a veteran backup should the Bills go with Nassib or another rookie (they reportedly have interest in Geno Smith and Mike Glennon). The Bills haven't made the playoffs since 1999, the NFL's longest drought. Finding the right quarterback is the key to ending that dubious run of 21st century futility. Remarkably, the Bills may not have the worst quarterback situation in the AFC East. The Jets, at least financially, remain committed for at least one more season to Mark Sanchez, who lost his form and his confidence during a miserable 2012 campaign. Sanchez, the fifth overall pick of the 2009 draft, guided the team to AFC championship games in each of his first two seasons. He regressed during each of his next two seasons, however, committing an NFL-high 52 turnovers over that stretch. Thanks to a contract extension negotiated by former general manager Mike Tannenbaum — the former part of that sentence is not a coincidence — Sanchez's $8.25 million base salary for 2013 is guaranteed. Whether he'll earn that money as a starter, or even make the final roster, remains to be seen, as confused owner Woody Johnson, newly hired general manager John Idzik, embattled coach Rex Ryan and new offensive coordinator Marty Mornhinweg (replacing the ruinous Tony Sparano) try to make sense of a tough situation. "What Sparano did to that kid set him back," said one AFC personnel executive familiar with the Jets' situation. "They set him up to fail. The system gave him no chance. It was like a grab bag. Every play was recess. He's not near that bad. But I don't know if they can save him. "Marty Mornhinweg's system will be more controlled, with some short to intermediate passes. I guess that should help him. I don't know what their long-range plan is. Rex has to win right now. So where are they going? It's a circus." Throw in the fact that the Jets lack offensive weapons, have a shaky line and are shopping their best player, cornerback Darrelle Revis, and it seems like a splendid short-term situation. What could possibly go wrong? The Jets, who are expected to cut Tebow, are looking at several veterans as options to compete with Sanchez and Greg McElroy. Former Jags starter David Garrard, 35, worked out for the team last week and may be on the verge of signing. 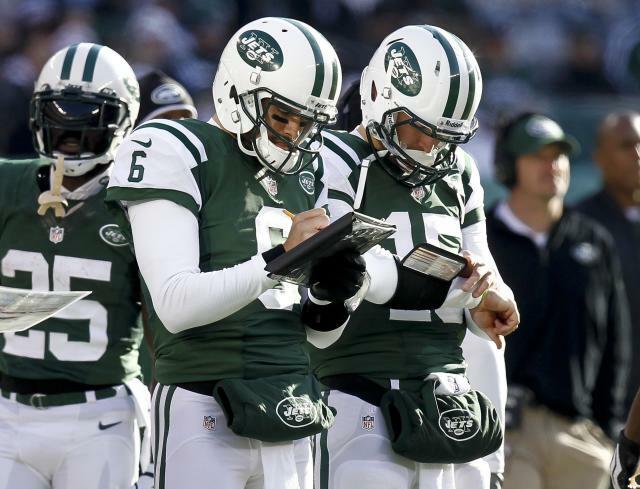 Former Browns, Broncos and Chiefs quarterback Brady Quinn may also be a target, as Jets quarterbacks coach David Lee has spoken highly of him previously. And with the ninth pick of the first round and seventh pick of the second round, the Jets are in prime position to draft a young quarterback as Sanchez's successor. 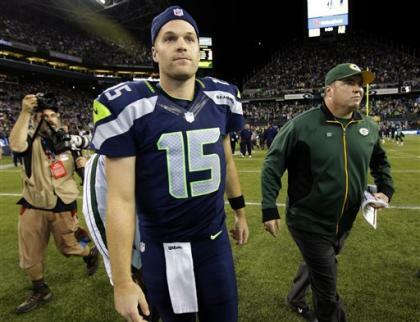 It's also possible that Idzik, who spent the past six seasons as the Seahawks' vice president of football administration, would be tempted to make a run at trading for Matt Flynn, Seattle's highly paid backup. Flynn, who shone in limited action as Aaron Rodgers' backup in Green Bay and was regarded as a prized free agent prospect a year ago, landed a three-year, $19.5-million deal with the Seahawks. However, he didn't have any other serious suitors. The Miami Dolphins — whose first-year coach, Joe Philbin, had been Flynn's offensive coordinator with the Packers — didn't make an aggressive contract offer. Then Flynn, somewhat stunningly, got beaten out by Wilson, a third-round pick, and was a forgotten man during the Seahawks' playoff run. Because Wilson's salary is relatively low, keeping Flynn as a high-priced backup isn't an odious prospect for Seattle — but the Hawks would surely listen to a trade offer and might consider swinging a deal for as little as a fourth-round pick. If New York, or any other franchise, has a compelling desire to land Flynn, it would be somewhat of a surprise given the lack of interest he received on the open market last March. "The thing about Matt Flynn, who no else wanted him last year?" said the same AFC personnel executive. "Philbin didn't want him; that told the whole story. Especially now, after Kolb and Cassel have failed. It confirms people's worst fears: that he's undersized, that the game's too big for him. Most teams viewed him as a really quality backup last year, and I doubt that's changed." Then again, a lot can change in 12 months. Just ask Alex Smith — and the team that gave up a pair of premium picks to acquire him.